Good morning. This is Ian Hoyer with the Gallatin National Forest Avalanche Forecast issued on Monday, February 11th at 7:00 a.m. Today’s forecast is sponsored by Bridger Bowl and Montana State Parks. This forecast does not apply to operating ski areas. This morning the mountains have 2-4” of new snow in Hyalite and near Big Sky and Cooke City, 3-6” in the Bridger Range, and 7-9” near West Yellowstone. Temperatures are around 0 F and winds are southwest at 15-25 mph with gusts into the 30s mph. Today, temperatures will rise into the teens with increasing southwest winds. Snow tonight will bring 2-3” near Bozeman, 4-7” near Big Sky, and 6-9” near West Yellowstone and Cooke City. Another 7-8” of new snow last night bring three day snow totals to around a foot (~1” of snow water equivalent) in the southern ranges. Strong and shifting winds (from southeast to west) built thick drifts on a wide variety of slopes, multiplying the load on a weak snowpack. With the wind shift and continued snowfall, identify and avoiding windloaded slopes will be more challenging than usual. Avalanche can break on weak layers buried 2-4’ deep, either mid-pack or near the ground. There were a number of avalanches on these weak layers in the middle of last week (photo, video, details). This new load will wake them back up and triggering an avalanche is likely today. Yesterday, a snowmobiler triggered a large avalanche in the Gravellys (details) and on Saturday a rider was buried by an avalanche in the Centennials (link to video). While both these incidents were outside our advisory area, the snowpacks are similar and they serve as good reminders of the sort of high consequence slide you can trigger today. The avalanche danger is CONSIDERABLE. The lower snowpack is generally stronger in the northern ranges and near Cooke City, and less new snow has accumulated. However, another couple inches of snow last night (generally 2-4”, 6” on the Bridger ridge) accompanied by strong west winds have built fresh drifts. These new drifts will mostly be thin, but be wary of areas where they have piled up more deeply and high consequence terrain where taking a small ride would be a big problem. Watch out for and steer around these wind drifts. Triggering avalanches on weak snow deeper in the pack also remains a lingering concern. Avalanches triggered on Saturday near Cooke City and in Hyalite broke 1-2.5’ deep and several hundred feet wide (details and photos, details). I also found these mid-pack weak layers yesterday on Buck Ridge and they were still producing unstable test results (video). Dig down 3-4 feet to look for these weak layers and assess their stability before committing to steep slopes. On wind loaded slopes, the avalanche danger is MODERATE. On non-windloaded slopes, avalanches are unlikely and the avalanche danger is LOW. If you get out and have any avalanche or snowpack observations to share, contact us via our website, email (mtavalanche@gmail.com), phone (406-587-6984), or Instagram (#gnfacobs). Our education calendar is full of awareness lectures and field courses. Check it out: Events and Education Calendar. February 22 and 23, Women’s Companion Rescue Clinic, 6-8 p.m. Friday at REI, 10-4 Saturday in the field. More Info and Register. February 16 and 23, 1-hr Avalanche Awareness for Snowmobilers, 7-8 p.m. Holiday Inn West Yellowstone. February 13, 1-hr Avalanche Awareness, 6-7 p.m. at Carroll College. Every Friday and Saturday, Rescue Training and Snowpack Update. Friday 6:30-7:30 p.m. at the Soda Butte Lodge. Saturday anytime between 10-2 @ Round Lake. This video interviewing one of the party members involved in Saturday’s fatal avalanche in Utah is a sobering account of a tragic accident. 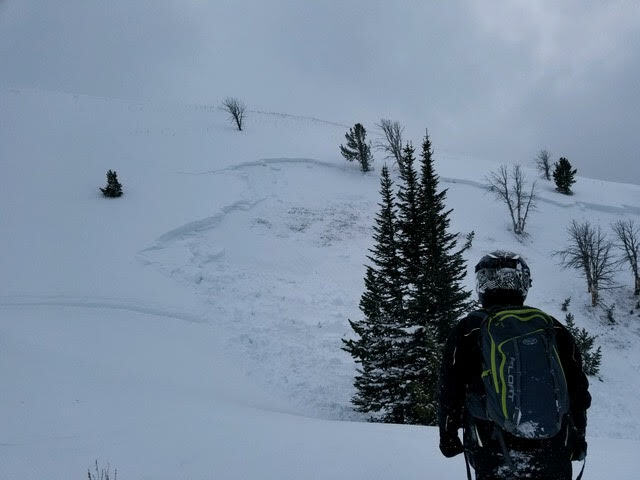 Avalanche triggered by snowmobiler on 2/9/19 on south face of Mt.